Doing some Googling while trying to come up with some new ideas for a Thai-loving client, I came across this quick curry sauce from Pinch of Yum. Ho. Ly. Crap. So good. So easy. And you could put it on anything — not just the obvious stir-fries, but any type of veggies (ooh, like the cauliflower cakes I have yet to post), even some kind of breakfast Benedict. It would be great on chicken and mild fish too, for the meat-eaters of the world. I made some brown rice and topped it with sautéed tofu and veggies — a little bit of whatever I had in the fridge. In this case, mushrooms, broccoli, red pepper, asparagus, button mushrooms, kale and the leftover zucchini noodles from my daughter’s dinner (which you saw earlier tonight if you follow VegOut on Instagram). 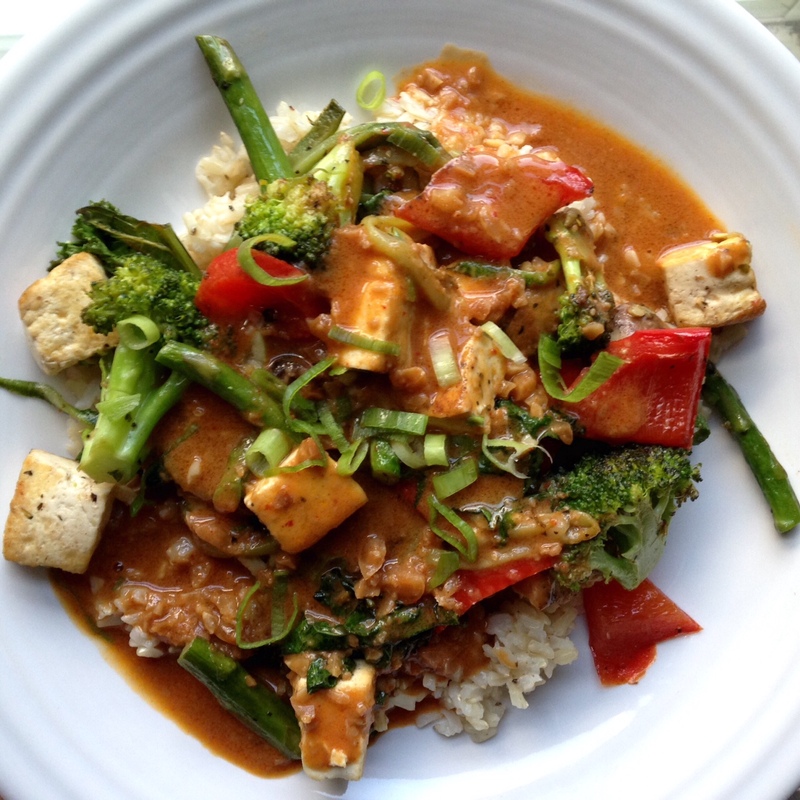 It’s like a perfect marriage between peanut sauce and a classic red curry. I like to eat things pretty saucy, and I would say this recipe made about 4 servings. I’m not a person who likes a lot of repeats with my food, so it’s kind of a big deal for me to say: I feel like I could eat this every day. This one will definitely be going in the rotation. I may just have to keep a jar of it in the refrigerator so I can whip up quick stir-fries throughout the week. The baby loved it too! OK, here it is. I have to go finish stuffing my face now. • 1 15 oz. can coconut milk (Original recipe calls for light, but I only had regular at home and it was great). • 2 Tbsp. red curry paste (I did rounded Tbsp. for sure. I can’t leave well enough alone). • 1 1/2 Tbsp. soy sauce or Bragg’s Liquid Aminos (In the interest of vegetarianism. Original recipe calls for fish sauce). Pour the coconut milk into a small saucepan over high heat. When it reaches a gentle simmer, add peanut butter, curry paste, soy sauce, lime juice, brown sugar and garlic. Whisk and keep on high heat for 15 minutes or until the sauce has reduced and thickened a bit. Add the peanuts and simmer for another 5 to 10 minutes. When the sauce coats the back of a spoon you can add a bit of water or broth (I added about 1/2 c.) to adjust consistency depending on how thick you like it. I went ahead and made mine pretty thin since I knew I would ultimately be sopping it up with some rice. If I were serving it as more of a sauce on a piece of tofu or aforementioned cauliflower cake, I would let it reduce a bit and get a little thicker. If the sauce separates, never fear. Give it a good whisk before serving. Enjoy!